Home Web Tools and Services What is Frostwire Plus? Features, Download, Is It Safe And Legal? Frostwire Plus is a YouTube downloader and a peer-to-peer file sharing platform that allows individuals to download and share different digital materials on Android. Using the program, you will be able to download programs for free, and without advertisements on the BitTorrent network. Although it is legal to use the program, where it becomes illegal is when you download copyrighted materials and share files that have copyrights. Through the years, we have seen many file sharing programs that have come and later left including the very popular Limewire. Four years after the demise of Limewire, another program would come as its reincarnation in Frostwire. Just like the former, this new program came to deliver freedom to people who want to download and share files with friends. As noted already, this is a BitTorrent Client and YouTube downloader that is designed for Android devices. It is a peer-to-peer application that you can use to download movies, music, and other materials on the BitTorrent Network without any limitation in terms of the size of the file. Apart from the torrent network, this application which also has a built-in music player is a cloud downloader and can be used to download files from SoundCloud and YouTube. When downloading on platforms such as YouTube and Soundcloud the main source is known, however, there are many different sources on the BitTorrent network as such you will not be able to preview files before downloading them. When FrostWire first began in 2004, it was launched for Gnutella and in 2011, a BitTorrent application was launched. Soon afterward, the Gnutella client. 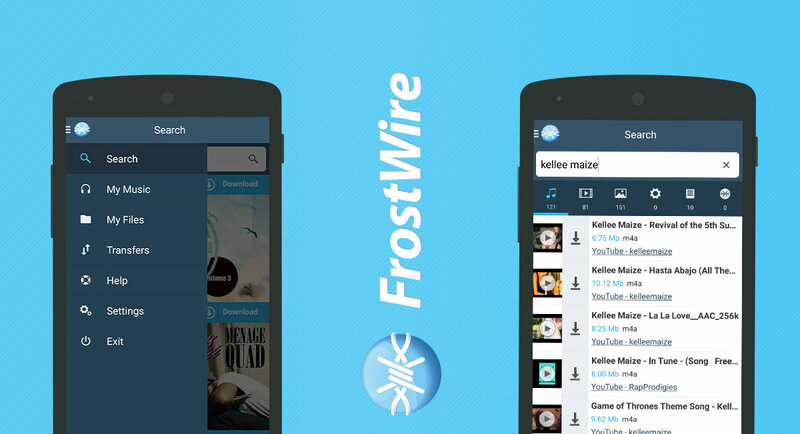 The FrostWire for Android or FrostWire Plus which is also referred to as FrostWire Downloader was designed based on the BitTorrent network and to support other multimedia downloads. One interesting thing about FrostWire is that it is designed for multiplatform use, hence, one can download and use it on devices including Java7 and 8, Linux systems, Ubuntu, Mac, Windows, and Android devices. In the same way that Limewire was ended, so also in September 2018, Frostwire announced it is closing shop after 14 years of operations. There are, however, some programs that can be used instead of the Frostwire such as the BitTorrent, Flud, Vuze, aTorrent, zetaTorrent, and CatTorrent. 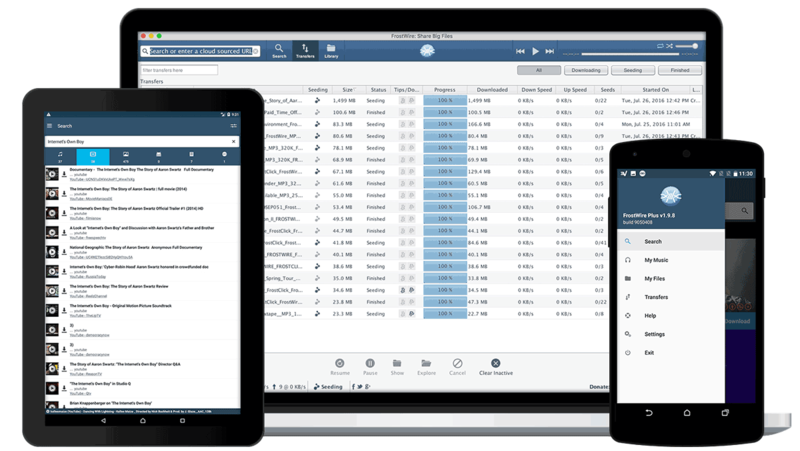 These programs, just like the FrostWire Plus, can also be used for Android devices. Check the box agreeing that you will not use the program for copyright infringement and agree to the terms. Click on Finish, Ok, and then grant access. At the top, you will see Download last installers. Under this, select the Android icon. Your program will then be downloaded and then installed. Make the seeding settings and accept all agreements (the seeding setting has to do with leaving files open so that others may also be able to download). Note: With FrostWire closing in 2018, the program may not be updated or maintained anymore and may even soon be taken off places like Google Play Store. It has an in-app search feature that pulls files from many platforms including YouTube, SoundCloud, and PirateBay.org. You can preview files from SoundCloud and YouTube. Two of the questions that get asked about FrostWire/FrostWire Plus has to do with its legality and safety. In terms of safety, the program is safe to use, most especially if you are downloading from the right sources. Back in 2008, the application was used to share the Ask.com toolbar adware to people who downloaded and installed the program. However, after FrostWire were asked, they acknowledged it and provided ways for users to uninstall the adware. Since then, there has been no issue of any other thing as such. Even though on its own, the app is safe, the files downloaded through it may come with viruses and other malware since some are from sources that you don’t even know and are not scanned. As to the legality of the program, many similar programs have continuously faced a lot of backlash for copyright infringement. FrostWire has not been immune to the backlash as it has continuously faced allegations of facilitating piracy. In 2015, the BitTorrent app was banned from Amazon for the same issue, although the developer insisted that the program only supports free and legal downloads. In the same year, Google would also remove the app from the Play Store for a violation of the Developer Distribution Agreement which was related to YouTube. The issues it kept having continued until September 2018 when FrostWire Plus was taken down from the Google Play. This was following a DMCA request which simply means that it is something relating to copyright infringement. This was what forced the developers of the app to pull out of the market since more than 80% of users of the program are running on the Android platform. In its defense, the developers argued that because the app is only a tool, it cannot be accused of copyrights violation because files cannot be uploaded there, neither can they be downloaded. No, FrostWire is not a virus. It is a peer-to-peer program that you can use to download and share programs and other files. While it does not come with virus, you may get a virus on your system when you are not careful of the kinds of programs and files you download using this program or any other program. What is the new FrostWire alternative? With the demise of FrostWire, there are many other programs that one can use such as BitTorrent, qBittorrent, Deluge, and AMule.